There was an article today in the news regarding food waste. Studies have shown that an average family in Britain throws away about £680 ($1000) of food every single year! This amounts to 7.2 million tonnes of waste food – 4.4 million tonnes of which could have been eaten (over 60%). Let alone the cash that could be in your checking account instead. The article goes on to quote research from a company called wrap, which suggests that 60% of people believe that food has to be frozen on the day it was bought. This is a ridiculous concept, as there is clearly no way of the manufacturers knowing which day you bought the product on! This got me thinking of what I do to save money on food. The biggest bit of advice I think I can give – and the most obvious – is to limit eating/taking out! When you stop and consider the premium you pay, ask yourself if you really need that second takeaway this week. Don’t get me wrong, I believe in the ‘experiences’ being the most important thing in life, so if it involved meeting with friends/family etc. then I am all for it; else, ask yourself if you are just being lazy. Well here they are – my 5 top tips to saving money on food! Look for bargains in the reduced sections in supermarkets. Even if you don’t eat it that night, you can freeze it and defrost it later on the day you want to eat it. I do this all the time, especially when meat is on offer. You usually find (especially in 24 hour supermarkets) that reduced sections get reduced again even further, later on in the evening as it approaches midnight. You can always find something that you will use at some point. The way I see it is that, even if you weren’t planning to eat/buy the item at that time, you can freeze it and eat it later! Be very conscious of ‘deals’. Often you see ‘special prices’ or ‘offers’ that are actually still more expensive than the loose equivalent. For example, my local supermarket (Tesco) often has apples, carrots, parsnips etc. in pre-packaged bags that are on ‘special’. I always weigh them and check the price of the loose equivalent. The majority of the time; the loose products are cheaper. It is amazing how many people look at a bright red sticker with a price and think they have got the deal of the century! Don’t let packaging deceive you. Often the cheaper version, or supermarkets own version of a product is in very unappealing packaging. We are all naturally attracted by advertising/endorsements/bright colours to be attracted to mainstream brands, when ofter the cheaper substitute is just as good. Take advantage of deals. I even go as far to plan our meals around deals that are running at local supermarkets. More often than not, you are able to check these deals online in advance and can make a meal plan. If you can make some savings on toilet rolls, cleaning products, tinned/jarred items then why not leave it in the cupboard for next week? If you are obsessed with keeping within a budget, write the expense off towards next weeks budget – this will save you money in the long term. Just be careful what you buy on deal – are you really going to eat that extra loaf of bread before it goes mouldy. (Then again, you can freeze it if you have space – YES its okay to freeze bread)!! Interesting about the research stats on 60% of people believing that food should be frozen on day of purchase. I must admit that I used to be one of those people! The thing is that food packaging does state that! Why not suggest that the consumer freeze before the use by date instead? It’s so strange to me that some people don’t freeze bread. I grew up doing that. Saving money on food can make such a difference. I always try and follow the 1% rule… instead of making one massive change, try and make a hundred little changes – saving 1% on an item of food isn’t that hard but it soon adds up and help save a lot! Cut dining out and you can save hundreds! Avoid dining out and save hundreds. I’m all about freezing food! I get a weekly CSA that is usually WAAAAAAAAY too much for one person…so I freeze a lot of it! That said, I have farm frozen vegetables year-round! Cooking in bulk, despite being a lot of work when you do it, pays off in money and time savings throughout the week. Awesome advice all around! Great post! 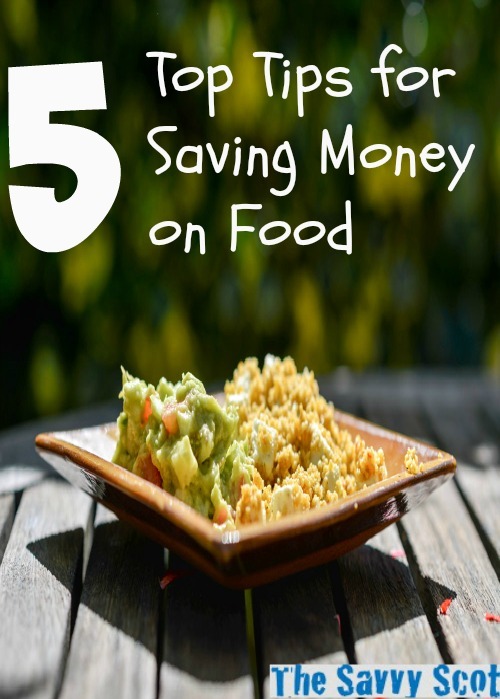 It seems amazing idea about 5 Top Tips for Saving Money on Food. Many will learn form this. Thanks for sharing. I usually look for bargains and I always make sure that I always bring my grocery list with me. I used to treat my family to eat out every weekend, but now I cut it down to twice a month. Thanks for this great tips on ways to save money on the food. CA will be very useful for me and I’ll put it in practical.